After a visit with Prime Minister Anthony Eden at 10 Downing Street, Garbo is seen walking with photographer Cecil Beaton in October, 1956. “We were friends in those days. I never asked to take her picture as 1 knew that was the last thing she wanted“, Cecil Beaton has said. But one day Garbo said: “If you just hadn’t been such a big and famous photographer ..." “Then you would let me take a passport picturc of you“, Beaton filled in. 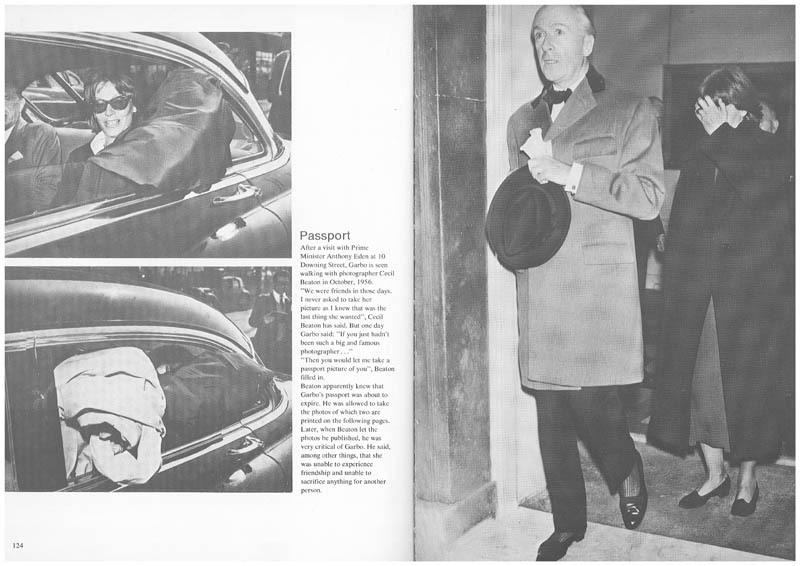 Beaton apparently knew that Garbo’s passport was about to expire. He was allowed to take the photos of which two are printed on the following pages. Later, when Beaton let the photos be published, he was very criticai of Garbo. He said, among other things, that she was unable to experience friendship and unable to sacrifice anything for another person.